If you’ve heard of epoxy flooring, you’re probably wondering what it’s all about – and what it’s used for. Epoxy flooring is a hard-wearing and durable flooring option that is used in many homes, as well as commercial and industrial areas. Epoxy flooring is a type of flooring that consists of multiple layers of epoxy – a type of polymer that is formed by combination of two liquid chemicals. Epoxy is essentially created by combining these two liquids together so that when hardened, they create a durable, seamless and hard floor. Epoxy flooring is defined as a floor with epoxy that is a minimum of 2mm deep; anything less than this is generally known as epoxy coating, rather than epoxy flooring. Epoxy flooring is common in commercial and industrial businesses and can be used in places like factory floors, show rooms, bathrooms and industrial kitchens, and in other areas like industrial offices and lunch rooms. Epoxy flooring is becoming a popular choice in modern home flooring due to its durability, its resistance to chemicals and cleaning products and the ease of maintenance. 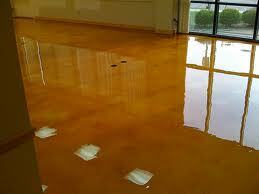 In residential homes, epoxy floors are common in kitchens, living areas, bathrooms, basements and garages. Epoxy flooring comes in a range of types, depending on whether you require it for industrial, commercial or residential use. Self-dispersing and self-levelling floors are generally considered good for high and heavy traffic areas and are used frequently in all types of businesses and at home. Mortar epoxy is the more durable and strongest of epoxy floors and is ideal to use as a base or to repair a broken floor. Gravelled, terrazzo and flake epoxy floors are considered decorative floors and are used to create a desired look – ideal for those looking for unique designs. The beauty of epoxy flooring is its flexibility when it comes to colour design, textures and patterns. Because it is made of liquid, epoxy flooring can easily be modified depending on the colour scheme of your home or work space. Epoxy can also be used to create different flooring patterns. You can have floors that resemble marble, tiles or stone, that are dotted or speckled or that are all one, seamless colour. Nice written, - good post! Epoxy flooring is not very well known yet but it's a great idea and I really like the way it looks.